Nifty PE Ratio Analysis - Are we at the Tipping Point? 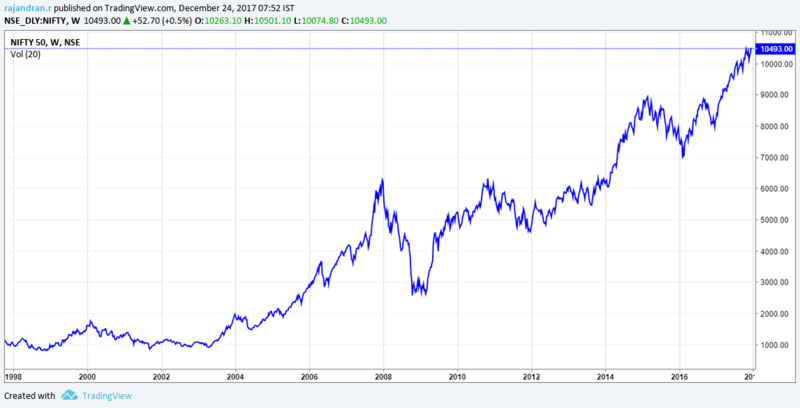 You are here: Home / Fundamentals / Nifty PE Ratio Analysis – Are we at the Tipping Point? PE – Ratio a simple metric used to measure the valuation of the market. From the numbers one can understand whether the markets are cheap, expensive or fairly valued. Current PE Ratio Metric at 26.86 is little above the 2 standard deviation. But one can still argue that markets are lognormal distributed rather than normal distribution. And often market shows a tendecy of “Irrational exuberance” i.e an overvalued market can remain overvalued for a prolong time without any logical reasons. However Lets consider a what-if scenario. What if the markets are really gonna be overvalued? how well you are protected from any potential downside risk? Do you consider hedging your investment portfolio or planning to reduce your asset allocation in stocks and shift some portion of your money to different safer asset class? If your answer is yes then possibly you are a well mature inventor and willing to handle any kind of market situations. Its not just about how much money you make in a bull market. It also matters how good you manage when there is a turbulence. So this time will it be different or just the history gonna rhyme? you are doing a lot of teaching working wide your write-ups and videos. I am your follower for 10 years. But we are missing your http://nsetracker.blogspot.com/ charts a lot.Is there any chance to revive it again.